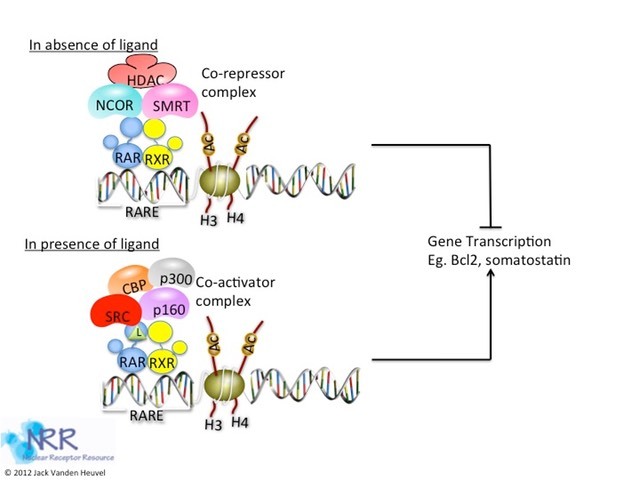 This gene encodes retinoic acid receptor beta, a member of the thyroid-steroid hormone receptor superfamily of nuclear transcriptional regulators. This receptor localizes to the cytoplasm and to subnuclear compartments. It binds retinoic acid, the biologically active form of vitamin A which mediates cellular signalling in embryonic morphogenesis, cell growth and differentiation. It is thought that this protein limits growth of many cell types by regulating gene expression. The gene was first identified in a hepatocellular carcinoma where it flanks a hepatitis B virus integration site. 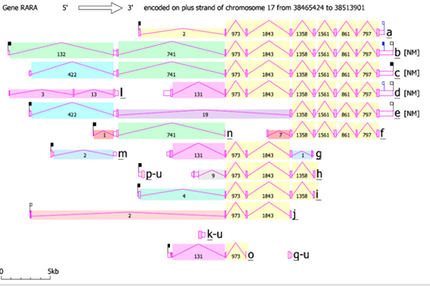 The gene expresses at least two transcript variants; one additional transcript has been described, but its full length nature has not been determined. There are 122 articles specifically referring to this gene in PubMed. Functionally, the gene has been tested for association to diseases (Adenocarcinoma; Alcoholism; Attention Deficit Disorder with Hyperactivity; Autistic Disorder; Bipolar Disorder; Brain Neoplasms; Breast Neoplasms; Carcinoma, Small Cell; Carcinoma, Squamous Cell; Chromosome Deletion and 17 others), proposed to participate in pathways (Non-small cell lung cancer, Pathways in cancer, Small cell lung cancer) and processes (signal transduction, embryonic eye morphogenesis, embryonic hindlimb morphogenesis, negative regulation of cell proliferation, negative regulation of transcription from RNA polymerase II promoter and 7 others). Proteins are expected to have molecular functions (DNA binding, protein binding, metal ion binding, retinoic acid receptor activity and 5 others) and to localize in various compartments (nucleus, membrane, cytoplasm). Putativeprotein interactors have been described (CEBPA, CEBPB, DNMT3A, DNMT3B, HDAC1, HIST4H4, MAP6, NCOA1, NCOA3, NCOR2 and 7 others). The principle application of this assay product is in the screening of test samples to quantify functional activities, either agonist or antagonist, that they may exert against the human retinoic acid receptor. This kit product is an all-inclusive assay system that includes, in addition to RARβ Reporter Cells, two optimized media for use during cell culture and (optionally) in diluting the test samples, a reference agonist, Luciferase Detection Reagent, a cell culture-ready assay plate, and a detailed protocol.